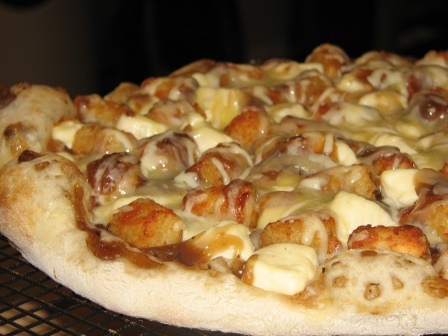 We have all these cheese curds we brought back from Quebec in the freezer so we thought should use them before they go bad and make a Poutine Pizza! 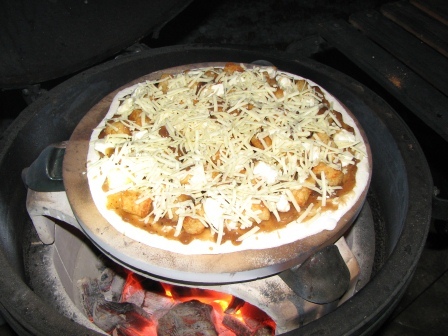 Now, we’ve done Poutine Pizza before and it didn’t work too well. The potatoes just didn’t turn out and the whole thing was a bit of a mess. Then it hit me! The problem was we tried to use potatoes from scratch before. Why not pre-cook some tater tots as the potato? Brilliant!!! We used condensed beef consume and Jackie made a beef gravy. 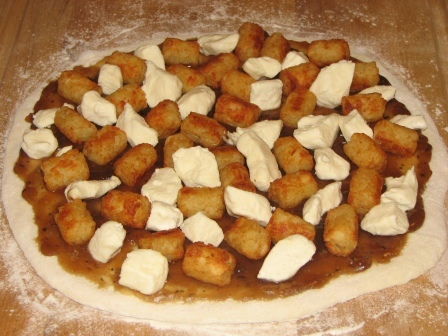 We cooked up some tater tots in the oven until they were good and crisp and then we built our pizza. 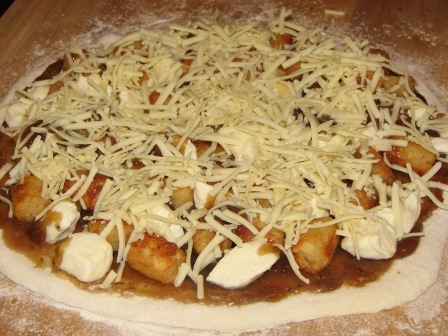 We started with Jackie’s standard home made pizza dough recipe. 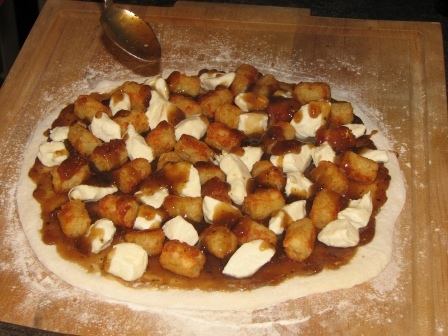 Then topped it with gravy, tater tots, cheese curds and a bit of mozza to hold it all together. Then onto a very hot Egg. The dome temp was around 600, the pizza stone was in the high 500s on the edges, high 400s in the center. Then pulled it off and let it cool a bit before chowing down. Poutine Pizza 2.0 was a cheesy success! I’ve heard plenty of things about poutine, but from what I understand its a Northern thing? Maybe Canadian? Not something they have in Texas, but from what I am imagining that pizza tastes like, it musta been a hit. Would love to try that one. Hey Jason, sorry for the long wait for a reply, but I’ve been busy this week. Yes, poutine is a Quebec thing and the best poutine I’ve ever had was in Quebec. This was made with Quebec cheese curds that we brought back in the summer. Went to Central market yesterday and what did spot? Cheese curds! They were orange though and from Wisconsin. Can those be used? For sure! They would just be cheddar, but use a lighter cheese on top to hold it all together. Our local cheese place makes cheddar curds as well, but I like the gouda curds I can only get in Quebec. I buy them when they are fresh and squeaky but to bring them home to Winnipeg, I freeze them at my sisters place before we leave and they make it here still frozen. Not as good, but better than nothing! Got a recipe for that gravy? I’ll see if Jackie can post it tomorrow, we have to help friends move today. It was simple, I think a can of Condensed Beef Consume and some spices and corn starch. I didn’t make it, so I’m not entirely sure.